Sweetness!! I love green,:love: Maybe the eyes look too dark because the eyelids are darker now too… I guess you can find balance between the elements with slight color tunings. Anyway you decide, it will look great, Outstanding work! Who Don look at you go man. I like the progress an I really like the fish man, cool color choices, and texturing. I think the worm could be pushed a little more. Anyway cool stuff. Just doing some testing with posing out the fellows a little more and layers in photoshop, I think i need to move on to the sea creature I want to put in the distance. I am thinking of giving the worm a vest and a holster and putting the fish hooks I made inside the holster. Getting closer, I decided on a more lighter background to help sell my western theme, the deep blue ocean is always seen just as that deep blue, so in my world I wanted these guys to live in a almost majestic merky golden sea. I also think it will help make the sea creature I put in the background really pop, I could be wrong but this whole thing has been trial and error, So Live and learn! Wow, What a radical change! It sure takes guts to do that:D And I think it worked!! Well, for the majestic effect you seek this last one is the better, the previous one looks kind of murky if you place em’ side by side. I’m sorry to bring this up at this point but seeing this one i felt that the worm’s head is too small, I think scaling it up would make his expression easier to read and make him more appealing, after all what I most like of the fish are his big eyes… I hope it helps! I love to see every new one of your posts! every time you find the way to surprise me. Thanks Everyone for the great feedback and comments! HFix I am glad you like the new BG! It was a big change from where I was but I think I am gonna stick to my guns, or fish hooks! Gord-MacDonald Hey man thanks, and your entitled to your 2 cents as we all are. I just decided to try somthing different is all, some will dig it and some will dig the other way, but hey its art, its no fun unless u take risk. SteevieWoo I am so glad u dig the change, and i think making the worms head larger is a fantastic Idea, and one I plan on doing. Hey Don, I really liked your “majestic golden sea” color, and the worm expression is great. 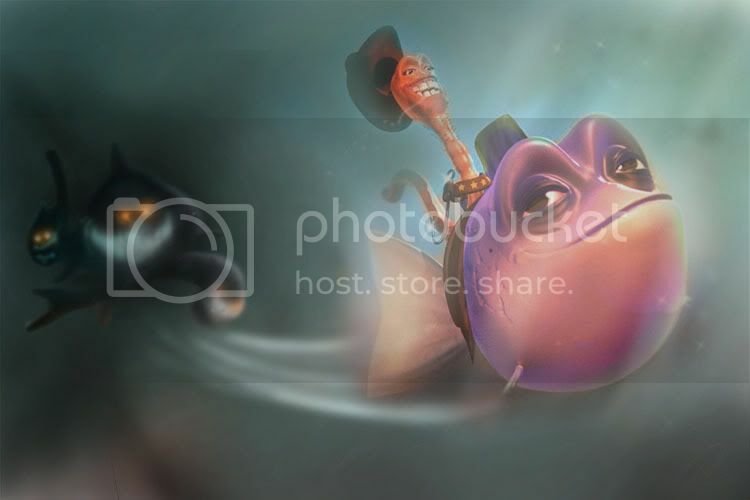 I agree with SteveWoo about head, or perhaps the worm showing towards to the front like " hey all guys, look to the best cowboy and horse… sorry…fish, on all majestic golden sea … the best friends!! " Only a comment. Again great work Don!! You know the best stories for me are the buddy flicks, yes they follow a very over used formula, two guys from different worlds, nothing alike and yet they bond, when in fact all signs should point that these two should not get along at all! There is something very cool and grabbing about that to me. Maybe its because I value my friends. Either way that was the basic idea behind this strange behavior competition I am workin on. The Story of John Worm a rough and tough worm who has escaped danger and had his run ends with many fishermen. He is tough and energetic and very fast! With a makeshift holster he carries with him a fish hook, fastest worm in the Majestic Sea! 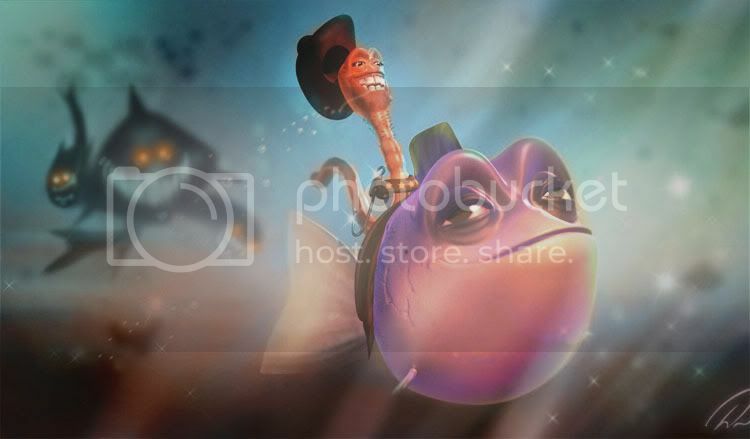 With him is his bud Colt the most friendly fish in the Majestic, also the most talented, he can escape any situation, which makes him a perfect match for John Worm. They are freinds on a quest for the golden sea horse, a master of the ways of the Wild Majestic Sea, when they meet him they will learn the key to unlocking the gateway to the underwater(what is belived to be myth) town of Gold and Sea dreams, where they will live fruitful lives as adventures of the Deep Majestic Sea. Hey Don, Its really looking great man… but you might try turning down the bright light by the sharks, its really distracting. But since you went 3d, you should also try out as many other camera options as you can. Sometimes I have created 15 or 20 random cameras around a model just to see if you can get an idea from a different viewport… you could be supprised what you find. Great job! Hey don… its me again! I hope you dont mind but I took your image into photoshop and messed around for a alittle bit. I think you can turn this from a good image into an awesome work with just a few adjustmens to the color scheme and composition. In this first one, I tried to get the guys to stand out more. They seem to be fading into the background in you last couple of images. So by lighting them and giving the background a complementary color scheme they really start to pop. In this one I was fiddeling with the composition. I just adjusted everyones placement and angle to create a loop for the eye flow. I think something like this would be a better option because people would look at the buddies first and the follow the eye flow back to the bad guys and the back to the heros. Also the “run away from the darkness and into the light” lighting scheme will help tell the story alittle better. Thanks man! And extra thanks for the visual examples, I like the use of the speed lines I feel thats something I def should incorporate!, The colors I like right now, I actually am ok with areas blending in and getting lost in some areas. The glow is a tad bit strong. And I could maybe give the buddies some more contrast using adjusment layers in photoshop, I even dig the composition thing, I do’nt know if I am gonna change it at this point but I may do something, either way I think I will take one more pass on it before I put this puppy to bed, LOL. Man! This has come a long way from the beginning! I’m glad you decided to take it 3D. It adds so much more depth to the image. Compositionally, its tough because you do want to keep the focus on the duo, but still show that there is conflict between their happy world and what’s pursuing them in the bg. Try the usual tricks, turning the image upside down, mirroring it, etc to see what feels right. My hunch would be to say to maybe push back those evil fish into more darkness and keep that area murky while that contrasts up against the duo in their volumetric light and drool. Maybe even rotate that camera a tad more to the front of the the two fish so we have more of a perspective going that has them coming toward the viewer more but still lets us see those bad boys in the bg…just ideas. Like you mentioned before, this is all art and is subjective to each and every one of us. I trust that you’ll finish off this project with a huge satisifying “save” and then take a nice long drag of one of those tasty cigs of yours. Made a few changes here and there, what I realize now is that I can try a million ways and colors and compositions, eventually I just gotta let it go and move on, and there are other things I need to move on to! I’ve put alot of man hours in on this and I am pretty happy with how it came out, whats cool is the next thing, I learned a lot on this one, so its time to rock on and keep going! I just hope I did what I came to do, make an image that makes people smile. looks like i missed quite a lot! but on the other hand its great to c ur final work! :love: very well done mate! good luck for the judging! You certainly got IT Don!! Biiiiiiiiig smile on my face!! Thanks for that! Is it… it really seems that… yep, I’ve got a smile on my face. Thanks, Don. You’ve done an awesome job. Wish you a good continuation!